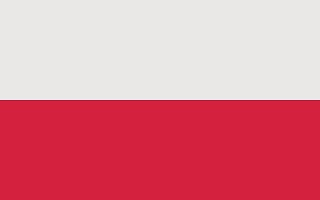 The Republic of Poland is an unitary parliamentary republic, covering 312.679 square kilometres and home to 38.634.007 citizens. 88% are Christians and the rest seems to be in doubt. The currency is Złoty, worth 1,76 Danish Krone an €0,24. The GDP is US$482.920 billion. The climate is mostly temperate throughout the country. The climate is oceanic in the north and west and becomes gradually warmer and continental towards the south and east. I will experience most, but unfortunately in the rainy season, as it is is also the warmest. The huge forest areas are home to many plants and animals. Among the more interesting larger mammals are the Wildcat (Felis silvestris), Eurasian lynx (Lynx lynx), Gray wolf (Canis lupus), Brown bear (Ursus arctos), European otter (Lutra lutra), Boar (Sus scrofa), Moose (Alces alces), Wisent (Bison bonasus) and Chamois (Rupicapra rupicapra). If I haven't seen the Wisent (Bison) earlier on the tour, I would like to experience it here. As mentioned, the fauna is rich too with 2300 species of vascular plant. However, there are no in particular I am looking for. 16/7 2018. I t take two hours to go over the bridge from Ukraine, and it is six in the evening. That means I don't feel like driving till after eight. The sun finally breaks through for real, and I'm driving through a flat farmland, pretty much like Denmark. Here are scatted farms and villages with nice houses. It is a upgrade from Ukraine for sure. I find a motel at a gas station, and get a nice single room for €16. A vegetarian pizza and a mug of tea is less than €4. I don't expect these prices to last, when I meet the tourist areas! This is truck driver territory. 17/7. I am considering making a detour around the Belarus embassy in Warszawa, to apply for a visa. But it will take all day, and I gamble, and hope they can make it in one day. I'm not sure, I can get the car in anyway, and we go together! The rain have caught up, and it is yet another murky day. I have two hours to the first sight, and it is through nice farmland. Well, it does look like Denmark, but the best places. The houses, on the other side, is a nice mix of well maintained brick houses and real old timber- and wooden houses. I make quite some photos of the old ones through the fog. While the houses are rather small, most of the fields are huge. The fog closes in, and it is hard to tell if, it is countryside or village. The most of the roads are real nice and smooth, and I reach Kazimierz Dolny before I know it. It is located next to the huge river Wisla, and here are several old vessels. The little town is a great mix of real humble timber huts, nice plaster houses and even one with a flamboyant sandstone facade. All I miss, is some sun. It is market day on the central square, with home-grown vegetables, knitted stuff and even cacti. On the highest point in the area, the remains of an old fortress is found. Several small churches are found within the town, and one almost up at the fortress. While I wait for the sun, I sip a mug of tea on the central square, and are rewarded with a few glimpses. Then I head on through more farmland. Here start to be a lot of fruit plantations: Cherry, blackberry and apples. A single farmer have a lot of hob. A few small forests and tiny villages brake up the huge fields. I see a few deer, but else it is only birds. Small lakes and swamp areas are the hunting ground for storks, but they tend to nest in the villages - where the nests are arrange for them. It seems like some of the chicks have left the nests by now. After a couple of hours, I reach the real nice town of Sandomierz. It is located around a huge square, lined with some old and real beautiful houses. A bit down from the hillside it is located on, its huge flamboyant church is found. Everything is decorated with polished brass, huge paintings and alike. An image of the Female God is almost covered in gold. A big renovation job is undertaking, but the glory is clear. Down in the valley, a huge iron bridge crosses the large river. The sun is still refusing to play along, and I grab a un-sweetened pancake with cheese, fresh vegetables and herbs; real good. Then the sun finally breaks through the dark clouds, and I get a few photos. It is 180 kilometres to next interesting sight, and the GPS estimate 3;20. Considering most is on big roads with 120 km/t, there must be some real bad ones as well . And the GPS did not consider the time it took to get through Katowicea! Roundabouts does just not work on four lane roads! Nor for the way too polite Polish drivers. The last 60 kilometres are apparently the slow ones; It start to be real hilly, and the darks clouds are pulling together, while it start to rain. I had a camp lines up, but I rather not miss this stretch. I find a nice hotel along the road, and call it a day - except from all the work with diary, photos and accounting. Southern Houses, Kazimierz Dolny and Gothic Sandomierz. 18/7. I'm up too early for the breakfast, but as it is raining, and I wait anyway. I get a lot of different things on several plates, and despite I leave the meat, I get plenty. The 60 kilometres towards Sanok it through a few hills, then the usual rather flat farmland with a lot of bushes and a few trees. I had hoped for more hills or even small mountains, but the rain make anything rather uninteresting anyway. Here are a lot of timber huts, but the lack of sun spoil the photos. Newer the less; I try, and one of the large wooden churches kind of succeed. After a couple of hours, I reach Sanok, which should be a nice town, but a combination of the rain and that I might be a bit spoiled, make it a slightly disappointing. I park at the market, found in an old parking house. Then I see the big square, surrounded by some nice but rather small houses. The pedestrian street is really dead by now. The most lively is the Svejk statue in bronze. The church is impressing, and here are some nice glass mosaics. I had hoped for a bit more - and less rain, but give up. I head on, and the landscape really flattens out by now. Only a few low ridges brake the plain. I can't help my self; I have to try to get some good photos of some of all the charming old timber huts. I pass a few towns, one being a real modern one, which seems so strange, after all the unspoiled countryside. The road head down the the lowland, but the weather does not really change. After additional two hours, I reach Biecz, which is the oldest settlement in Poland. Besides from that fact, it is not really interesting. The central church is rather special, the houses around the central square real small. I start with a huge Greek salad at a restaurant in a real old house, hoping for some sun. Despite I take my time, it keep raining. Next sight is 150 kilometres away, three hours driving. That might improve the weather condition? Well, it start being real foggy, then I pass Grybow, which seems like a nice town - but not in the rain. Some of the modern churches are real fancy. In a sunny day, I would have pulled over and made photos. Now, they kind of disappears in the fog. The road passes through another hilly area, but they don't really turn big before they vanish again. Somehow, I might consider my self lucky, the rain occurs here, where the landscape is so close to the Danish. The rivers I passes are really flooded with brown water, and it is clearly raining in a waste area. As I pass through a town, the traffic grind to a stop, and I spend two and a half hour, driving five kilometres. Everybody is taking is calm, none overtakes, but give way from those joining in from side roads. This is the most civilized drivers, I have experienced ever! It finally turns out, it is a way too small roundabout that causes this endless line. I had expected a roadwork or an accidence, but this is an everyday experience. And due to the huge river, there are no alternatives. To add to the insult, the sun is making the car a sauna for two hours - the only sun of the entire day. I had expected to reach the hostel in Zakopane early, and even have time to get a new pair of front tires - once more. Instead, I get there rather late. It is a popular hostel, but nice and real cheap. I join a German for dinner, and after a bit of fumbling around, we find a real cosy place. Timber building, stuffed with old things, packed with guests and a great quartet, playing traditional music. Back at ten, I start on the few (120) photos of the day, and the diaries. 19/7. The hostel got real quiet at eleven, and at eight in the morning, I'm the only one awake. The forecast is again with a lot of rain, and I am considering spending another night here, and then see Krakow in the dry. The breakfast is included, but there are a power failure in the kitchen area. I eat in the light from my computer. At ten, the rest start to wake up, and I walk into Zakopane town - all 200 metres. It is a cosy town, with a few old wooden houses and a lot new ones, housing restaurants and shops. The drizzle and lack of light make photoing it difficult, but I walk around anyway. A small river runs right through, and that create some great motives. Here are an absolutely astonishing amount of souvenir shops and alike. An area next to the larger river is with leather jackets and sheep fur. Other shops have a lot of wood-work, some have round breads and honey and some; a lot toys. Here are, despite the weather, a lot of tourists, but I don't hear a single word I understand. From some areas, one can see the low, misty mountains, and here are some green areas within the town. I find a falafel wrap after noon, and then I have been soaked enough. Back at the hostel for a cup of tea, and to pickup the car. The weather is still not for it, but I head out to Lake Morskie Oko. It should be a short but beautiful drive, and at least, I get dried up and warmed a bit. It is only 18C and a cold breeze add to the autumn feeling. It is a 13 kilometre flight, but 30 on the road. Then there is a closed road, and it is 55. It is into the low mountains, and the road is lined with huge timber houses. It if wasn't for the rain and fog, I guess it would be an awesome tour. Well, it is still nice. The rivers have swollen, and full size conifers are floating bye. I stop a few times, but it is a bit hard to appreciate the nature in the rain. When I'm eight kilometres from the Morskie Oko Lake the road is closed once again. It might be a nice lake, but I'm not going to walk in the rain! And now, there are no alternative roads - legal. And the area is swarming with police. I guess the rain have hit the area hard. I find another, longer route back, but it is not as interesting. I reach the hostel close to five, and work a bit before I head out to hunt supper. The forecast have changed, and now the slightly better weather is postponed to Saturday. Zakopane and the Lake Morskie Oko tour. From here, I head into the western Poland in Diary 2.